Fergus View is located in Kilnaboy, two miles north of Corofin Village in Co Clare. Kilnaboy is situated in the famous Burren area of North Co Clare and is the gateway to a countryside of extraordinary scenic beauty. 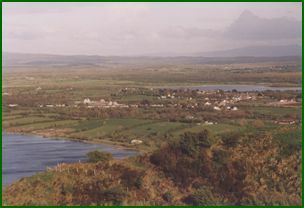 The house itself overlooks the River Fergus,the scenic remains of Kilnaboy Medieval Church with ruined tower, and gazes across beautiful, tranquil rural landscape at Clifden Hill, an area which abounds in Celtic legend surrounding the mystic Fionn Mac Cumhaill and his band of warriors known as the Fianna. Corofin Village (2 miles) has good restaurants and plenty of good pubs. Irish traditional music can be heard in many of the pubs on various nights of the week. There is also good fishing in the area. The famous Cliffs of Moher are about a 25 minute drive away and a tour around the North Clare coast is most rewarding. The Ailwee Caves near Ballyvaghan are about a 20 minute drive from the house and en route one passes by the famous portal dolmen grave of Poll na Bron (Hole of the Sorrows). Lahinch Beach is a 20 minutes drive and Ennis the capital town of Clare is just 10 miles away. There are also plenty of opportunities to play golf in the area in Ennis, Lahinch and Gort. Shannon Airport is a 45 minute drive from us. The pretty market town of Ennistymon is 11 miles away, and Kilfenora, home of the Burren Interpretative Centre and the unique Doorty Cross, is just 5 miles away.